I am a gradute of the Royal Manchester College of music. Later doing post graduate studies at the Guildhall School of Music and Drama. 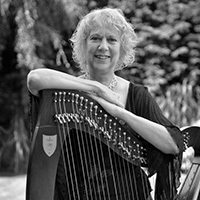 My work with a group of autistic children led me to buy a small harp as an experiment. Both the children and I completely fell in love with the harp and so a period of intensive training followed, including lessons from some of the country's top harpists. I now play with several local orchestras and enjoy singing at weddings and other functions. My unique style of singing and playing covers many different genres of music, offering a wide range of styles in my repertoire. I also teach harp and I am director of the successful 12 - strong Dudley Harp Ensemble.